A lot of wild and fantastic things have been said about the Marianas over the years, up to the present. Some of it is borne out of ignorance, and some of it is invented because it's entertaining to the purveyors of tall tales. Apparently, one such fanciful tale was that you could get eaten up by cannibals if your ship happened to take you to Guam in the 1800s. The story was that a 16-year-old boy had been captured at Guam and fattened by the natives to be the main course in a banquet. Every westerner who sailed the Pacific in those days could have set the record straight. One did; a rather colorful seaman named Joshua Slocum. A Canadian-turned-American, Slocum was a veteran seaman who could be found in all the world's oceans. He spent a good deal of time in the Philippines and almost anywhere else you could imagine. At least once, we know, he set foot on Guam in 1879 on his way from Hawaii to Manila. On Guam, he replenished his water and food supplies, and visited Hagåtña while his ship lay in Apra Harbor. Slocum wrote to a newspaper in 1889 mocking the report of cannibalism on Guam. He wrote that Guam had no cannibals and was a Spanish colony for a long time already. It was a place frequently visited by many ships to stock up on water, coconuts, yams, sweet potatoes, pigs and goats, all in abundance. "One of the pleasantest days of my life was spent on this pleasant island off there in the Pacific Ocean," he wrote. 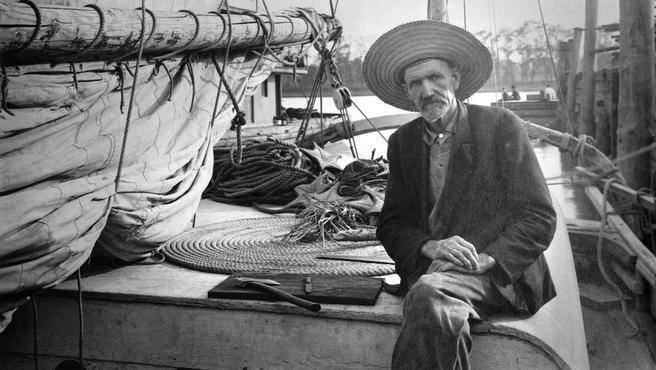 Slocum later achieved fame by being the first human being to sale around the world all alone, on his boat, the Spray, between 1895 and 1898. Sometimes I think Washington's perception of Guam is not too far different from that stupid newspaper clip. Who was in a position to check the veracity of the story?